The Villa Mozart y Macondo is beautifully decorated with amazing artwork, inspired on colourful nature beauty, and topped with caring service. The atmosphere is fresh in the morning, peaceful throughout the day and tranquillity fills every corner. People come together here from far and wide just to enjoy a comforting walk near the ocean side, feel the stroke of the smooth ocean breeze, and see the colourful array that the sun offers when it starts to fade away. Inside Villa Mozart there is an exotic green garden, with plants in every size and shape possible some of these plants are fruits trees or plants that help give food great taste like ¨zapote, lemon, noni, coconut palm trees, cinnamon, vanilla, pepper¨ and more. The garden also counts with a small breakfast café, the food is prepared as organic and healthy as possible. For breakfast the property offers a variety of fresh Mexican and vegetarian meals. For host comfort the property offers Wi-Fi available for all host needs. The manager can recommend many nice restaurants where host can go ahead and taste different types of food that go from Spicy Mexican flavour to Sweet Italian homemade ice-cream. If you would like the property can also put the host in contact with eco-tour guides to see dolphins in their natural habitat or seek other kinds of animals that are within Puerto Escondido, animals like migrating bird, butterflies, crocodiles and see fish in the river. Villa Mozart y Macondo, is located approximately 3 min to one of the most beautiful beaches in Puerto Escondido it named Carrizalillo. This beach has thick white sand, gentle sloped waves and the water is a crystal clear greenish-blue. This beach is a little bay surrounded by tall thick rocks that cut the strength of the waves and make them calm, its quiet perfect for sunbathing on the smooth sand or snorkel in the fresh water. 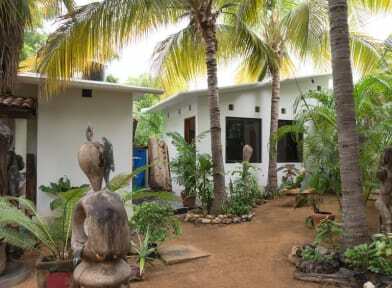 The Villa Mozart y Macondo offers 2 comfortable and beautifully decorated bungalows for 2 people. The bungalows have a king sized bed with wide windows, a complete bathroom, out in the open kitchen and table to enjoy your meals. Bungalow 1: This room with king size bed is equipped whit ceiling fan, desk, wireless internet access, safety deposit box, bathroom with shower, amenities and hot water. This room with artistic touch is ideal for couples who enjoy an intimate space. Also has kitchenette and refrigerator outside. It is located in the Macondo garden with direct access to our coffee El Tololote. Bungalow 2: Room with a king size bed, safety box, wireless internet access, ceiling fan, bathroom with shower, amenities and hot water. Set with artistic style features a terrace to enjoy a good read, Macondo beautiful garden view and direct access to our coffee El Tololote. No 24-hour front desk. Opening time from 7 am to 8 pm. Child friendly. For more information, please do not hesitate to contact the property.